What better way to show you my appreciation for your support of my blog than with a giveaway..right?! Over the last three years, that I've been blogging can you believe it's been three years?! I've really grown very close to my supporters, you guys have given me support, showered me with compliments and and even prayed for me when I needed it! I've connected with many other bloggers and formed lasting friendships. I've had the opportunity to collaborate with many brands that I admire and I'm truly grateful! This blogging thing has been great to me and I'd love to pay it forward! 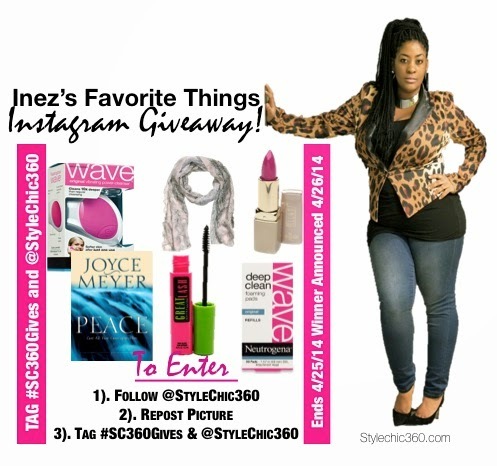 So, I've collected a few of my favorite things and will be giving them away via my Instagram! You guys know I love a-n-y-t-h-i-n-g animal print and scarves are pretty much a daily staple for me, so I'll be giving away a cute H&M scarf. I've really been into my skincare lately and love this little gadget, so I thought you should have one too, I'm also throwing in a set of Neutrogena Wave deep clean wave refills. I'm pretty obsessed with mascara and so I'll be giving you away some Great Lash Masacara by Maybelline. I love the look of natural eye and mascara for me does the trick! Milani Lipstick, specifically Rose Hip has became my go to lipstick, no matter the season, it adds a great pigmented pop of color to any outfit, its definitely my favorite! Joyce Meyer has become one of my favorite spiritual forces. I love how she breaks the word down and I've been obsessed with reading her books and listening to her teachings, Peace by Joyce Meyer is one of my favorites, so you'll be receiving it as well! I really hope you guys enter this giveaway as I celebrate you! Thanks again for your support! Giveaway ends on Friday April 25, 2014 and the winner will be announced on my blog on Saturday, April 26, 2014.